I bought my modest, three-bedroom house as a single guy (try to put yourself in that mindset as we go along). I was in my twenties, and had a considerable collection of UNC memorabilia. I’m talking tons of autographed basketball and football jerseys. I had amassed quite an assortment of magazine covers, both signed and unsigned. The collection of autographed team basketballs rivaled the equipment room of a middle-school gymnasium. I’d hung signed posters, photos of myself with many different UNC legends, and all sorts of cool miscellany that I’d been given or picked up over the years. Picture a guy trying to replicate the UNC Basketball museum on a much smaller scale, with football and basketball pseudo-artifacts; that was me. So it only made sense that I’d designate one of the rooms in my new place not as an office or a study, an art studio, or even just an extra TV room: This room would be my shrine to Carolinasports. 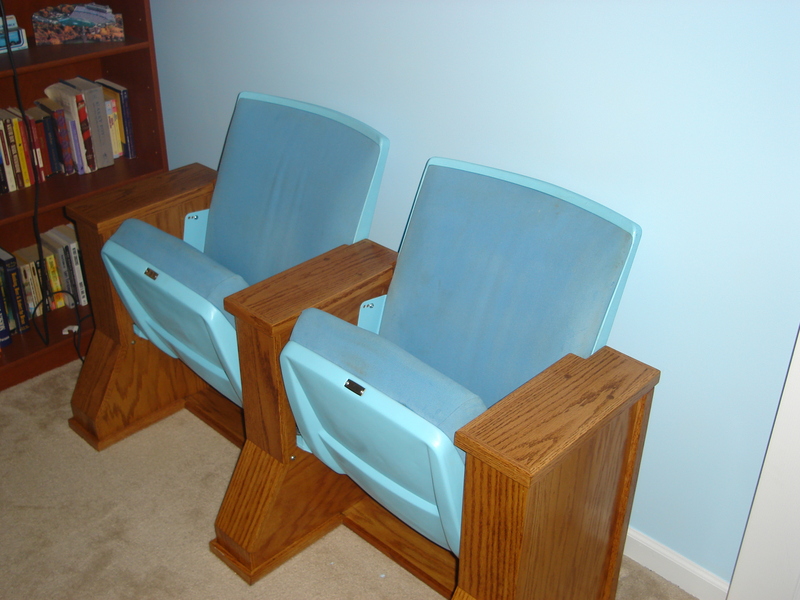 It’d be my retreat to watch games while sitting in my custom-built stadium seats, fashioned from old ones from the Dean Dome. Heck, as a hobby one month, I bought an unfinished coffee table, painted and finished the top of it to scale to replicate the SmithCenterfloor. And when the woman I’d eventually marry moved in? Yeah, she actually helped me to paint the walls Carolina Blue. Every visitor to our place got to see it. I showed it off as if I were a curator of a small-town art museum, who happened to have an exhibit of original Van Goghs. This was my Taj Ma-Ball. And I was going to have to destroy it. You see, when your family is about to grow by 50% in a soft real-estate market, your options for space are limited. We couldn’t use the guest bedroom (though I lobbied for it for a good ten minutes), because I didn’t want to deal with explaining to my folks why they’d be sleeping on the floor of my man-cave on visits. I also learned that apparently babies need space for more than just a crib; else I would’ve just stationed her very fashionably downstairs in the den, right beside the dog’s bed. They’d be friends and he’d protect her, right? What else…storage closet downstairs is nice, but that’s also where I keep my fishing rods and tailgate gear. It became crystal clear: my shrine was going to go from Dude Lair to Diaper Central. As we got closer to the due date and started getting the things we needed for the house, I asked my wife to let me take care of the deconstruction. While it would have probably been less painful for me to just let her do it while I played 18 holes one Saturday, it just felt like something I needed to take care of myself. I started framing this as an opportunity to actively begin accepting my new identity. It’d give me an opportunity for some reflection as I packed the stuff away. I found a storage unit, and began the process of cataloging and boxing everything up. I stashed the autographed 8 x 10 I got from Michael Jordan from a previous line of work. I wrapped up the autographed team poster of the Captains of the infamous 8-20 team that I had framed (NEVER FORGET!). I boxed the photo of a dozen of my closest buddies and me before Butch Davis’s first game at Kenan. As I packed each piece away, it hit me…I’m not getting rid of any of this stuff: I’m actually preserving it. And one day, not only will I be able to pass this stuff on to my daughter; I’ll get to indoctrinate her into this unhealthy passion I like to call being a Tar Heel! What began as a painstaking chore of personal evolution started to become a vision of personal legacy. Not only was my wife growing a small human, she was growing a next generation Tar Heel. While I cannot say lifelong (thanks, Dad), I am a long-time Tar Heel fan, '01 UNC grad, and consider myself just as passionate and knowledgable as the next guy. My wife, also a UNC alum, and I recently became first-time parents. I'm going to attempt to chronicle my personal struggle to come to grips with going from mouth-breathing Fanboy to only-somewhat-crazy Fan-Dad. The thoughts I share in this space are my own...though they may be heavily influenced by a lack of sleep. This entry was posted in Miscellaneous, UNC and tagged fatherhood, man-cave. Bookmark the permalink. 6 Responses to Deconstructing Fandom…literally.